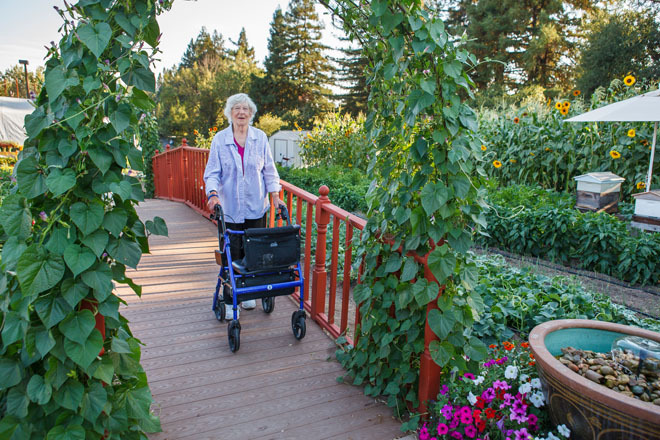 At the Healdsburg Senior Living Community, a legacy lives on in an uplifting garden scene. 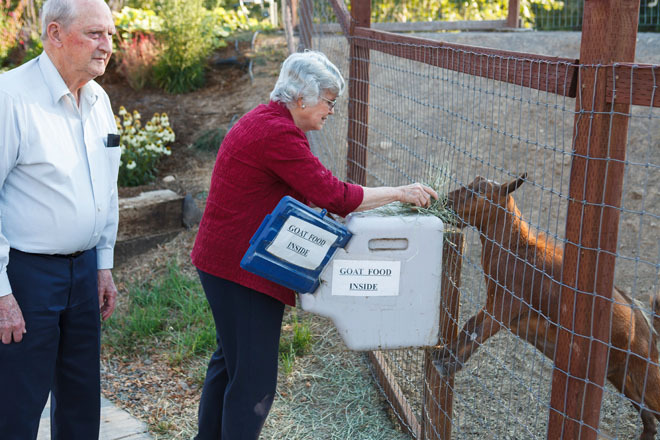 A large space behind the community is filled with waves of vivid flowers, corn and sunflower fences, sprawling squash vines, precise rows of peppers with fruits like Christmas ornaments, therapy gardens, friendly goats, and darling therapy chickens. Tony Fisher, the facility’s Marketing Director, conceived this magical scene six years ago as a tribute to his foster mother who raised him and his three brothers, as well as seventy-five other foster children. For residents who may feel their life spirit is fading, a garden would give them an opportunity to connect with life, he thought, each on their own terms and abilities: actively propagating and transplanting, cutting and arranging flowers, petting the chickens, eating an explosion of cherry tomatoes, or walking the exercise trail through the opulent morning glory-clad arches surrounded by bees, butterflies, and brilliant flowers. Visiting family members appreciate the beauty and young ones run in the open air, interacting with the lively garden. 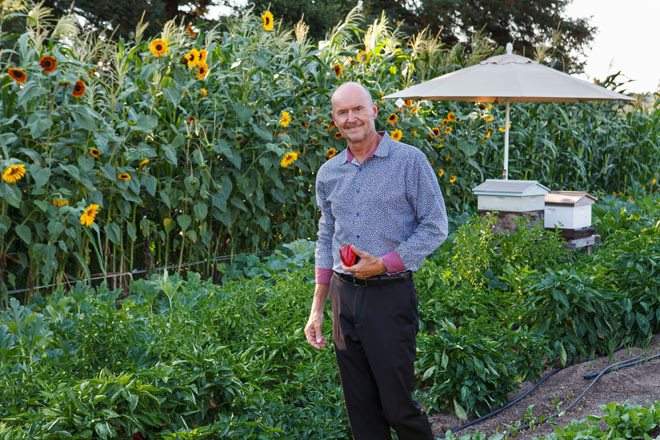 Wanting to give all residents the opportunity to experience purpose, value, and contribution, and to connect with life, Tony engages the residents to start each season’s seeds. And while they may plant them too deep or too shallow, they all grow, giving residents a direct connection to the life a seed embodies. 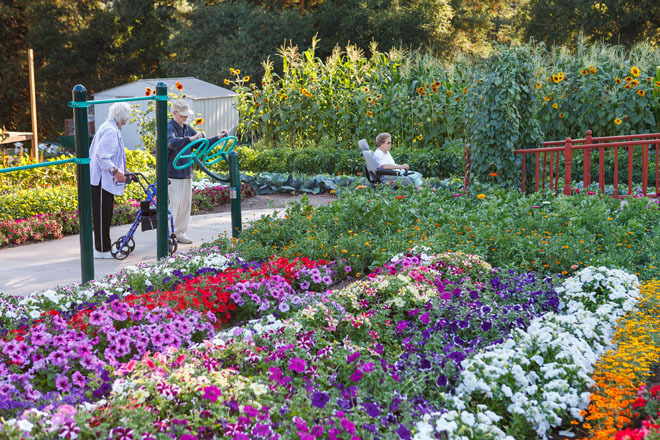 A stroll or wheelchair ride in the open air among colorful flowers, flitting butterflies, and movement in the garden, offers memory care residents a respite from daily frustrations. When he began this project six years ago, Tony was a complete novice at gardening, and his idea and the garden were initially small. Every year it expands and over time he has developed an efficient system for managing the garden’s complexity, allowing it to be run by a minimal amount of people and effort. Amending the hard-packed soil with organic compost each year, installing a systematic irrigation system, planting flowers for beneficial insects and bees, crop rotation, strict weeding, and disease-resistant vegetable varieties have generated an easy-to-maintain garden glowing with health, life, and lots of produce. 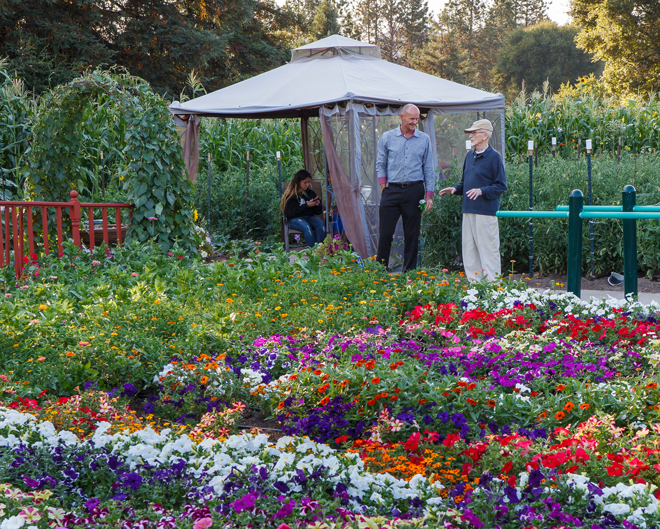 Each year, Tony tries new, colorful varieties to create a “wow” factor for residents. Beehives and worm bins, once entirely new ideas for him, are now a part of life. The garden keeps growing, and each year it encompasses more area. 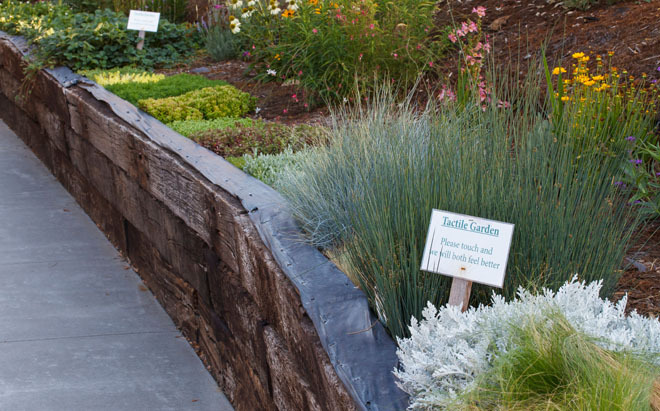 Recently, an elevated sensory garden was added for those who suffer from loss of touch—but it is intriguing for all. Every two feet along the garden’s edge reveals a different group of low-growing plants at fingertip level, with textures ranging from velvety, grassy, stiff, soft, and rubbery. Alpine and large strawberries are next. On the large bank above them, a profusion of new plants attracts hummingbirds and butterflies. 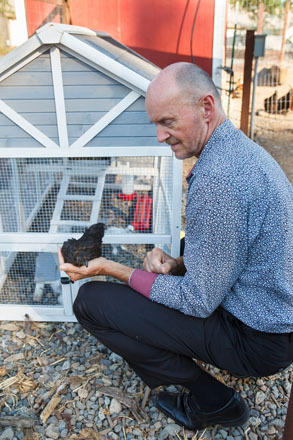 Each year, Tony adds more funny and friendly chickens, like plush Silkies and frizzled Seramas, breeds and characters whose strutting and capers delight young and old alike. 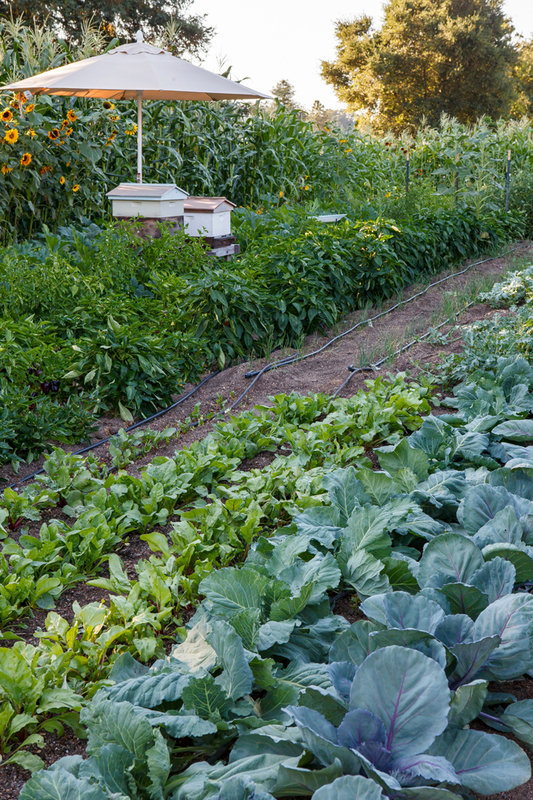 The garden lives and thrives through the energy of many. Executive director Rob Matthews does the rototilling and finds funding for the garden. Julia Agee, the activity director, holds activities and parties in the garden. Physical therapists help residents with the new exercise equipment in the garden, and the kitchen staff prepares meals featuring garden produce each day. 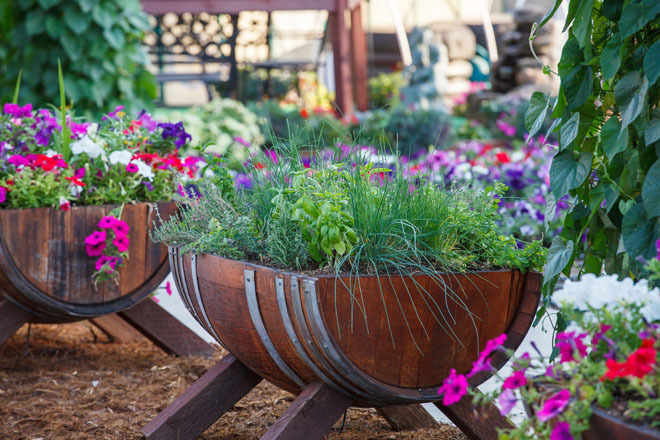 The community’s owners, John Alaux and Tom Patzke, listened to Tony’s enthusiastic idea for the garden and gave him the opportunity and freedom to create it. Now, they express pride in the profuse and vibrant perfection of each row. But it is facility workers, Javier and Lino Castro and Lino Montebello, who are its primary tenders, and who work with Tony to perform a multitude of tasks in the garden and around the property to keep it manicured and glowing with health. The garden is a daily showcase of perfection, revealing the pride, attention, and efforts of many. Tony says, “People say the garden is amazing. 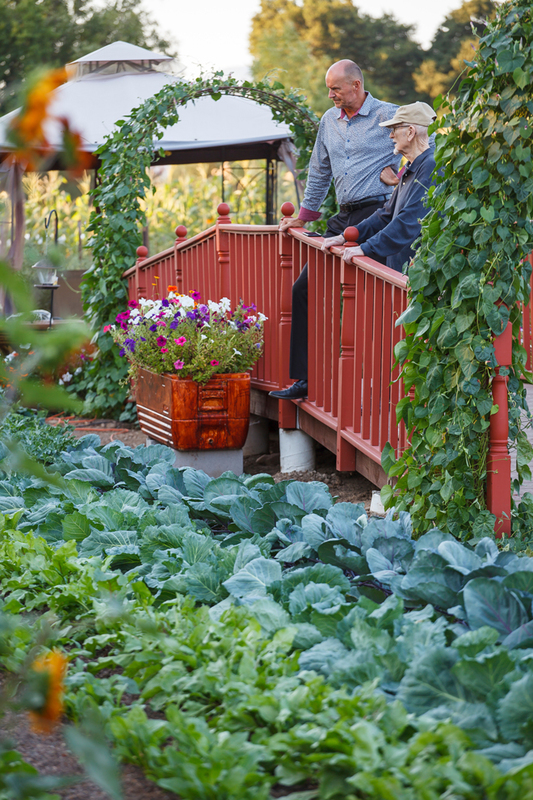 I tell them, what is amazing to me is that there are not more like it.” His greatest wish is that he and the garden can help generate more gardens of life and connection. People tell him, “Tony, I didn’t know you were creative.” He replies, “I didn’t either.” Turns out a garden is in all of us.